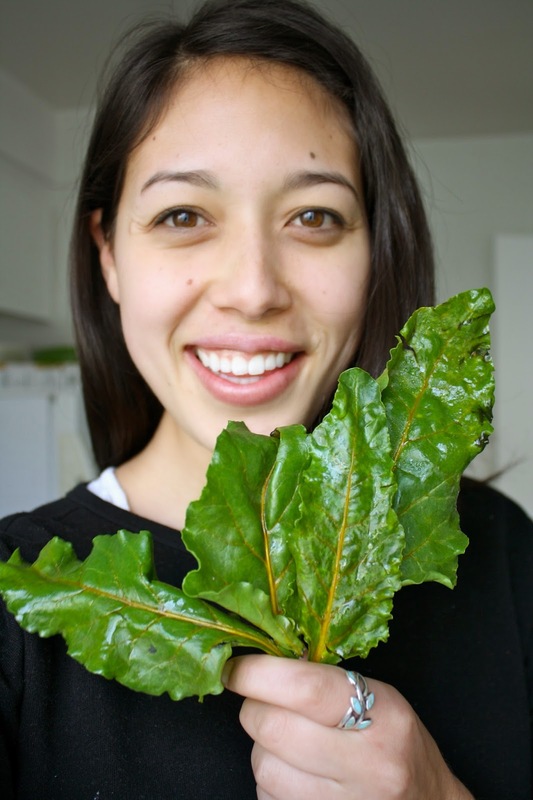 If you could have one last meal, what would it be? 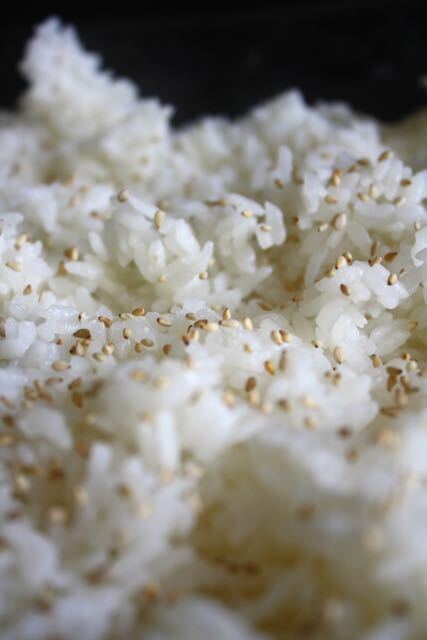 Now normally I'd instinctively start making an extensive list of all my favorite foods: rice! ramen! udon! mom's tortellini soup! ooh, I'd want some corn! and froyo! I must have tart froyo for dessert (with shredded coconut and some mangoes and nutella, of course). 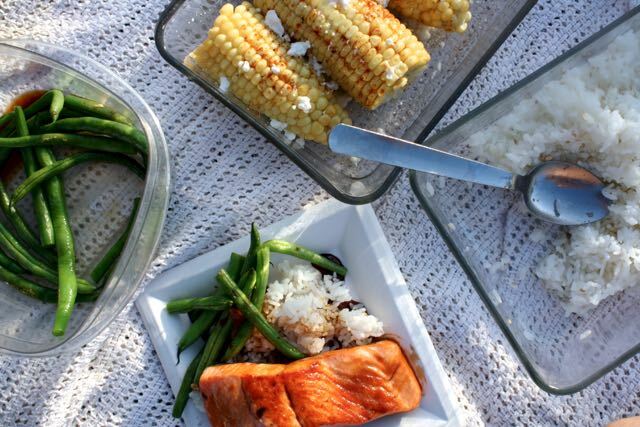 But, if I really think hard about the one meal I'd want to have over and over again, it'd be salmon teriyaki with some white rice, wok fried green beans, and maybe some corn on the cob. It's a meal that has a lot of balance to it. That sweet buttery fish with flaky skin, crunchy fresh green beans, and the slightly fragrant sticky rice satisfy that comfort that I crave and the freshness that I need. We ended up making my "last meal" and packed it up and took it to Barnsdall. It was a perfect warm summer evening and a we had the perfect meal to enjoy with the LA sunset. 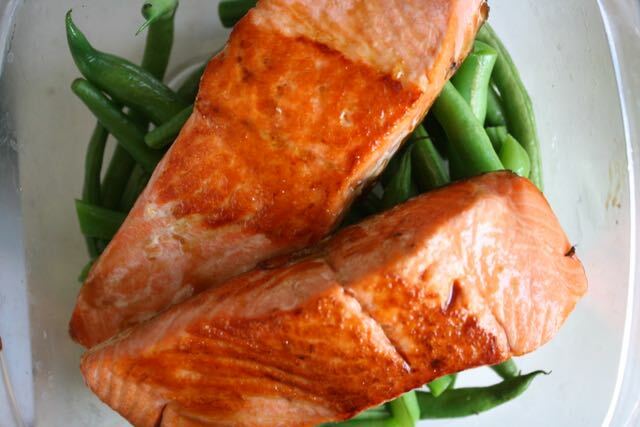 Rinse your salmon fillets and pat them dry with a paper towel. Add a dash of canola oil to a wide pan and warm on medium/high heat. Place the fish skin side down in the pan - you should hear a sizzle if your pan is hot enough. Cook for about 4 minutes until you see the pink flesh turn white about halfway up the fillet. Flip and cook for another 4 or so minutes until the side of the salmon is white (meaning the pinkish raw flesh is cooked). Turn the heat in the pan down to low and add about a 1/4 cup of teriyaki sauce. My favorite is Yoshida. I pour that stuff on everything! 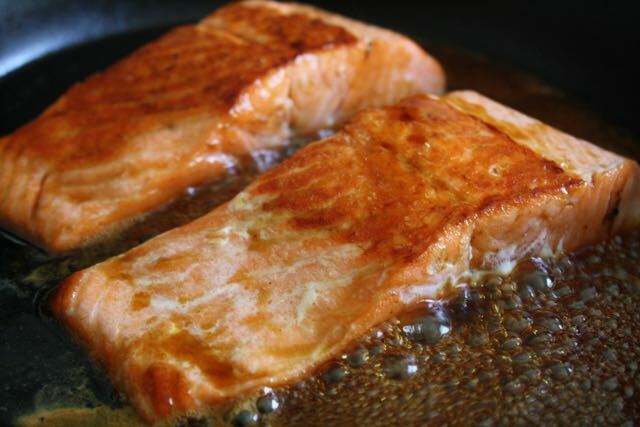 Let the sauce reduce in the pan and thicken and flip the salmon once more to get a nice glaze on the fish. Remove from pan and let rest, pouring the remaining sauce over the fish to marinate the flavor more. 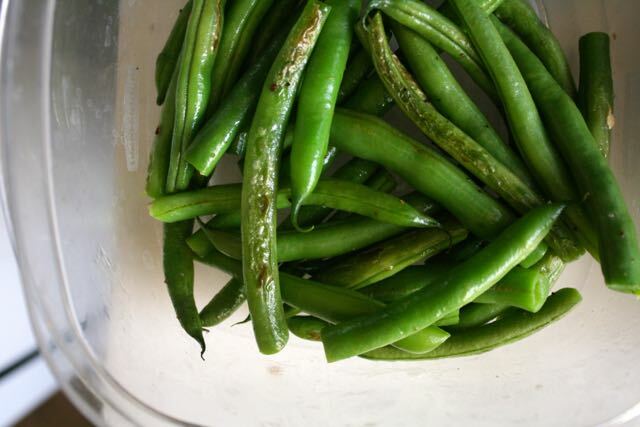 Rinse and trim green beans, then cut them in half. In the same pan you used for the salmon, heat a dash of canola oil on high. Add the green beans in the hot pan and hear them sizzle and crackle. You should see the skins start to blister if your pan is hot enough. Move the pan around to cook the beans on all sides. Then add lots of fresh cracked pepper, I usually do 5 or so cranks. Add a little soy sauce and a teaspoon of water to the pan and immediately put a lid over the beans. You should hear them sizzling in the pan. Let them steam in the pan for about a minute, then remove the lid and shake the pan to see if the beans are cooked. I like the lightly crunchy but blistered from the hot oil. If you want some spice, add a few chili flakes too! Voila! Add your corn to a large pot of boiling water so the corn is just barely submerged. Place the lid on and cook for about 5-8 minutes until the kernels turn from white to more translucent yellow in color. Remove from water and let the corn drain and cool on your serving dish. 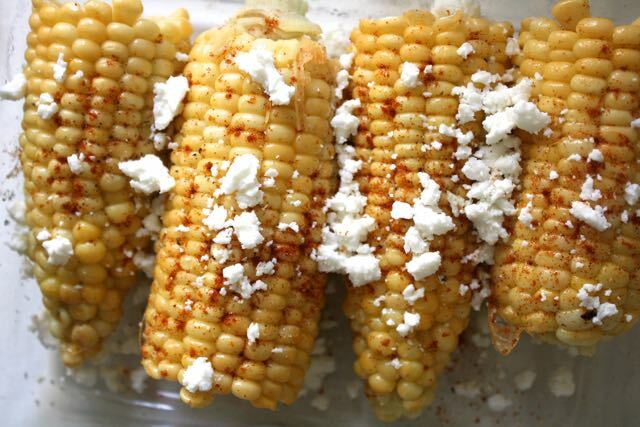 Add pats of butter to the tops of the corn so they melt, then lightly dust corn with a little cayenne, paprika, and kosher salt. 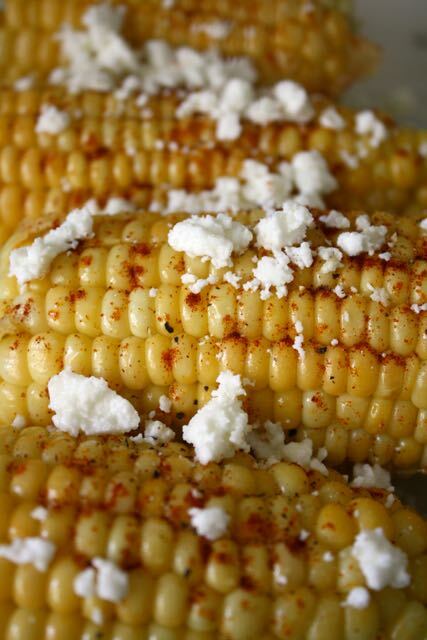 Then top with some crumbled cheese like feta or cotija, whatever you've got on hand. The cheese might melt a little and release a richer flavor. That's it! p.p.s. What would your last meal be??? Post in the comments section so I can try and recreate it for you!